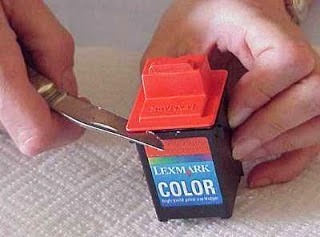 Learn how refill the color ink cartridge Lexmark No. 26, with the next steps, one by one. The 26 tricolor Lexmark ink cartridges are ink cartridges of really good performance in comparison with their price, these ink cartridges are rated for about 160 pages when new and 150 pages after being refilled. Follow well the procedure show next in case of questions leave a comment in this post. Normally these cartridges have two holes to be refilled under the lid located in the top of the ink cartridges that is the only thing that complicates a little bit the refilling process since for doing so a knife or a blade will be needed to detach the lid. Remove the lid on the top which serves to fix in the piece holding the cartridge inside the printer, you will see the ink cartridges colors and proceed to supply the corresponding ink in the corresponding color, you will need about three syringes to provide ink to the cartridges. In each syringe you will need about 4 ml of ink and with this amount of ink the cartridge will have a good rate and perform well when printing. The same syringe must not be used for all the colors. You can also be interested in knowing how to refill the No. 16 Lexmark black ink cartridge. You can be interested in how to refill the No. 17 Lexmark black ink cartridge.